11 of Ultiworld’s top 25 mixed teams square off in Columbus this weekend, and with bids on the line, the Elite-Select Challenge has the chance to completely upend the Nationals picture. Surprise top seed #20 Boston League of Shadows headlines the field, alongside Pro-Elite Challenge winners #7 Denver Love Tractor, but odds are good that we’ll see upsets across the board this weekend. With so much at stake, expect a tight, competitive tournament from top to bottom, and success could hinge on the points teams score, not just the wins they log. How Do the Colorado Teams Fare Post-PEC? You can’t deny the home-field advantage Colorado teams have at the Pro-Elite Challenge. This year stood out even more, with every Colorado-based team making it to the final of their respective divisions, including a Denver Love Tractor v. #8 Fort Collins shame. battle for the championship. Love Tractor fell back to earth a bit at the U.S. Open, going 2-4 against USAU competition, leaving us curious which version of the team is the real one. Love Tractor wasn’t worried, though. “The results weren’t what we wanted in Minnesota, but we saw the growth and the adjustments we wanted to see over the course of the weekend, finishing out stronger than we started. We haven’t gotten a lot of bad weather yet this season, so Minnesota was a great chance for us to be able to gain experience in the rain and a thrower’s wind,” said coach Jesse Kuroiwa. With the weather looking cooperative so far this weekend, expect to see Love Tractor playing closer to the potential they showed at the Pro-Elite Challenge. Kuroiwa also appreciated the opportunity to work on situational chemistry against top competition. With so many new faces on the team this year, facing adversity and challenging weather helped as the weekend wore on. Kuroiwa believes the team will be able to take those lessons learned and put them to good use in Columbus, “playing up to our potential against the team in front of us.” They can expect more stern tests from #22 Boise Lochsa, #25 Iowa Chad Larson Experience, and Cincinnati Steamboat this weekend. The Jack McShane-Jesse Roehm combination has proven to be potent on offense, and expect to see their names with regularity all weekend. shame. have been (unsurprisingly) off the tournament map since the Pro-Elite Challenge. They followed the same schedule last year, though, and made a run to the final. We should know by now that this “casual” team can ramp up and play with the best at any time. Adding another standout deep threat in Joe “Smash” Anderson only helps their deep game, easing the burden on Jake Juszak and Nick Snuzska. Combined with Aubree Dietrich’s ability to stretch defenses deep and pick up big gains underneath, this offense will keep shame. in every game this weekend. With the humid conditions in Columbus, there may be a bit of an adjustment period for shame.’s throwers, but this is a smart team that can make the adjustments they need to stay out in front. Don’t expect to see either of the top Colorado teams falter this weekend. The rest of Pools B and C have their work cut out for them to knock either Love Tractor or shame. off the top perch. “Being in Boston, we play against some of the top teams in the division on a regular basis, and so we know that we can play with anyone when we play our game. This tournament is a good opportunity to test ourselves against some out-of-region teams that we haven’t seen before and that haven’t seen us before,” said captain Dan Rosengard. The second year squad has certainly been through the gauntlet of some of the best mixed ultimate has to offer this season. A strong showing could push this team into a fourth bid for a crowded Northeast region, but regardless, a chance to work out the kinks against some of the best in the country will help. The headliner to watch out for here is Tyler Chan. The former Ironside cutter can claim to be among the fastest men in any division, and his performance at the Boston Invite spurred the team to their early success. However, this is an athletic team from top to bottom, and that athleticism has been the key to grinding through games and making waves among the elite teams. “Obviously we’re pumped about the success we’ve had so far, but we’re not really too focused on results at this point. It’s a long season, and we know we’ll need to keep cleaning things up to do well come the Series,” said Rosengard. With perennial Nationals qualifier #19 Minneapolis No Touching! in their pool, League of Shadows will get pushed by a team well suited to slow down athletic squads and force them into a more precise game. That fourth round matchup should prove to be the Boston team’s toughest challenge since June, and will be a good litmus test for how far they can go at Regionals against more of the nation’s best. So many good teams, so few bids to go around. That’s been the running theme for the Southwest region over the past few years. 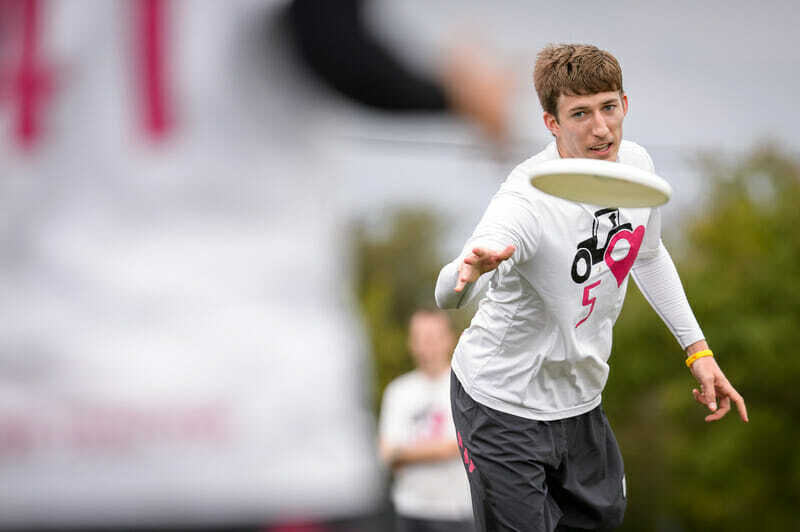 Last season, #16 San Francisco Blackbird pulled together a complete performance at the Pro Championships to lock up a second bid for the region at the last gasp, and this season is no different. Currently, only San Francisco Polar Bears sit within bid territory in the USAU rankings. San Francisco Mischief, Blackbird, and #17 Los Angeles 7 Figures are all in the top 25, but on the outside looking in for bids to Nationals. With all four teams playing this weekend, and all but 7 Figures in Columbus, collective success will be the difference between a single bid melee and some relative breathing room for the region. Moving out of the regular season, the overall goal for Blackbird remains to win Sectionals and Regionals. Regardless of the number of bids, this team will be gunning for the top spot in the region, and their history shows they can pull it together. Adding standout cutter Barrs Lang back into the fold will help, and Briana Cahn impressed in limited minutes at the Pro-Elite Challenge. Alongside Malina Wiebe and Mac Taylor, Blackbird has the team to make a run when it matters. For Polar Bears, the story is similar. Their victory at the Select Flight Invite was an excellent first step, but there is still room for improvement for a team looking to peak at the end of the season. Despite offering a welcome confidence boost, the team knows they need to improve in order to stay in the hunt for Nationals. While they’ll be missing a few veterans this weekend in An-Chi Tsou and Greg Marliave, look for Amanda Meroux and Joe Thompson to step up and aim to keep Polar Bears in the thick of the bid conversation. They will certainly want to avoid a repeat of last year’s 0-3 pool play performance, and coming off a Select Flight win, expect this team to be ready for their regional matchup against Mischief. Speaking of Mischief, Ultiworld’s preseason darlings got off to a rocky start, struggling through some close shaves at the Pro-Elite Challenge before righting the ship to win Revolution two weeks later. The offense struggled mightily in Colorado, missing effective initiating cutters to jumpstart the flow. However, Jordan Jeffrey returns to provide big throws and bigger skies. If VY Chow is healthy, the Mischief offense suddenly becomes much more dangerous, and that ought to be enough to challenge Polar Bears for the top spot in Pool D, and push into the bracket and possibly earn another Southwest mixed bid. Both teams will have their work cut out for them against a strong #12 Durham Toro team and can’t get too caught up in their own matchup to ignore the Southeast challengers. New rankings were released this week, and there’s a logjam that will get cleared up this weekend. #11 Washington DC Space Heater is at eighth in rankings, but the gap from them to 22nd ranked San Francisco Blackbird is only 117 ranking points. With 11 of the teams in that range in action at the Elite-Select Challenge, the Nationals bid picture will surely get reshuffled throughout the weekend. In addition to the Southwest, the Northwest region will be hoping for a strong showing from Boise Lochsa (and #21 Seattle Birdfruit at the Northwest Fruit Bowl) to hang onto a third mixed bid. The North Central is in danger of a single bid, with #13 Madison NOISE sitting as the last team in. With No Touching! and Chad Larson Experience sitting just outside, the North Central has a lot to gain. With #3 Minneapolis Drag’n Thrust looking as strong as ever, upsets and close games at ESC would give the rest of the North Central region a much greater margin for error at Regionals. ESC represents the last chance for most of the field to lock up bids for their regions, and despite the focus on growth for many of the teams, the pressure is mounting. Comments on "Elite-Select Challenge 2018: Tournament Preview (Mixed)"